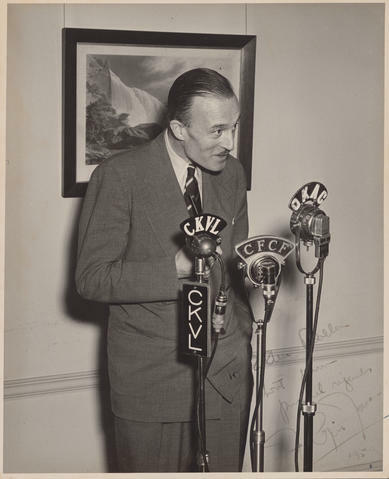 File contains a photograph of Frank Cyril James (Principal and Vice Chancellor of McGill University from 1939 until 1962), standing in front of three microphones for radio stations: CKVL, CFCF, and CKAC. The photograph may have been taken at one of the concerts celebrating the 50th anniversary of the McGill Conservatorium. Photograph taken at the same event as MS-5-2, Box 10, Folder 15. Description created by Rebecca Shaw on February 26, 2018.